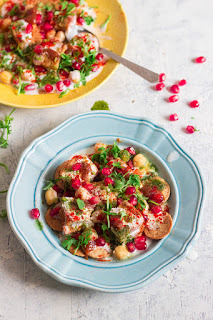 Popular Indian accompaniment made with yogurt, boondi (fried gram flour balls) and spices. Namaste guys!! Happy friday, it is weekend, almost!! I hope you are planning for a relaxing weekend. I've realised that my weekends are busier than my weekdays. I plan every Sunday night, that my next weekend will be relaxed and I won't take on more than I can do, but come weekend, and I'm either cleaning or cooking or gardening and by Sunday night, I need another weekend to recover from my weekend. But this Sunday is relax-day for sure. It is my Birthday!!! and seriously who cooks or does laundry on their birthday. So I'm all ready to chill out and eat what others have cooked. I've made dinner plans with family for Saturday night and I plan to spend the d-day at home reflecting on my year's achievements. Not really!!! I just plan to not plan anything for Sunday, cause I'm tired of planning. So let's see how Sunday goes, I'll keep you updated on Instagram (may be). Anyway, this Boondi Raita is as chill as I want to be. It is my favorite kind of raita. Raita is a popular Indian condiment or accompaniment to spicy rice dishes like Biryani. Raita is always made with yogurt and either cooked or raw vegetables, sometime, fruits like pineapple too (I love this one too). In this case it is made with Boondi. Boondi is fried gram flour balls. 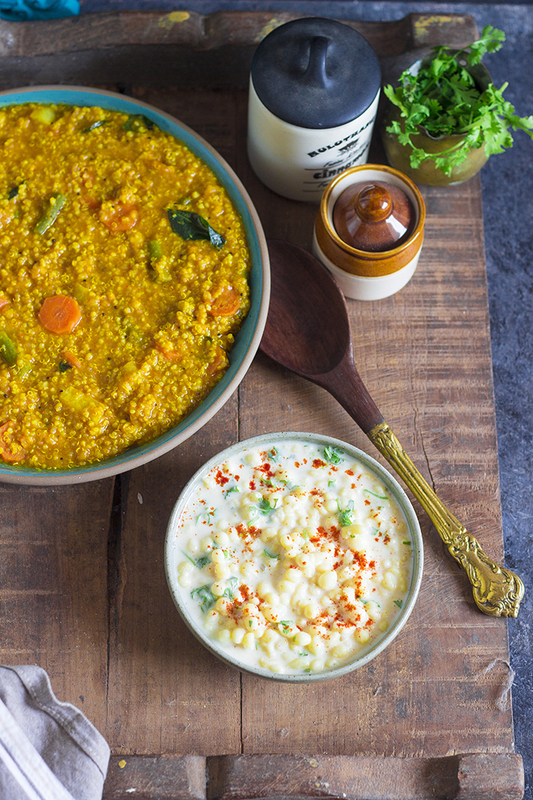 Boondi can be sweet or savory, in the raita, we always use the savory one. 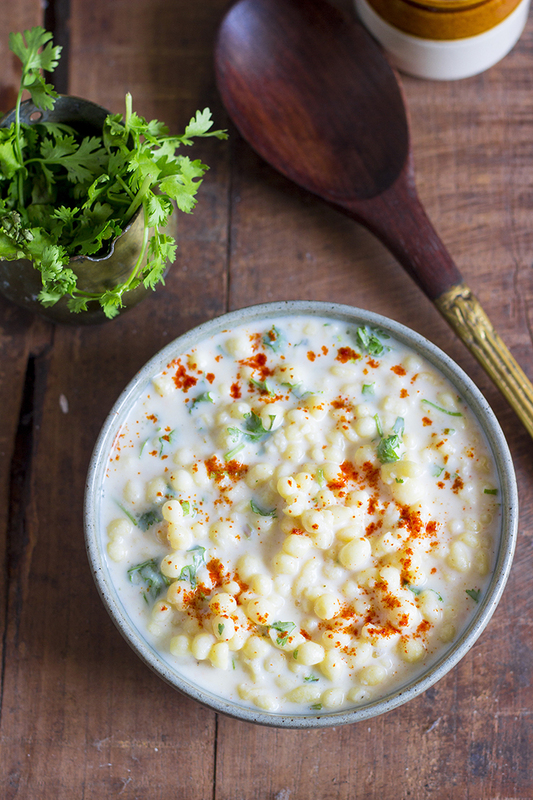 The boondi is soaked in warm water until it gets soft and added to whisked dahi or yogurt or curd and a mix of spices are added to mildly flavor the raita. You can find boondi in the snacks section of supermarket or you can buy "Raita Boondi" online. 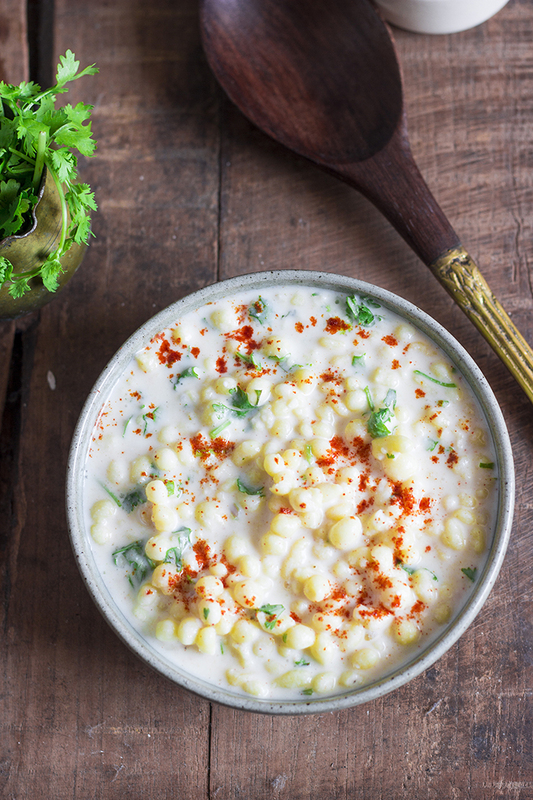 Raita is best served slightly cool or at room temperature. It is cooling accompaniment to any spicy meal. Raita is a popular yogurt based Indian accompaniment to rice dishes. 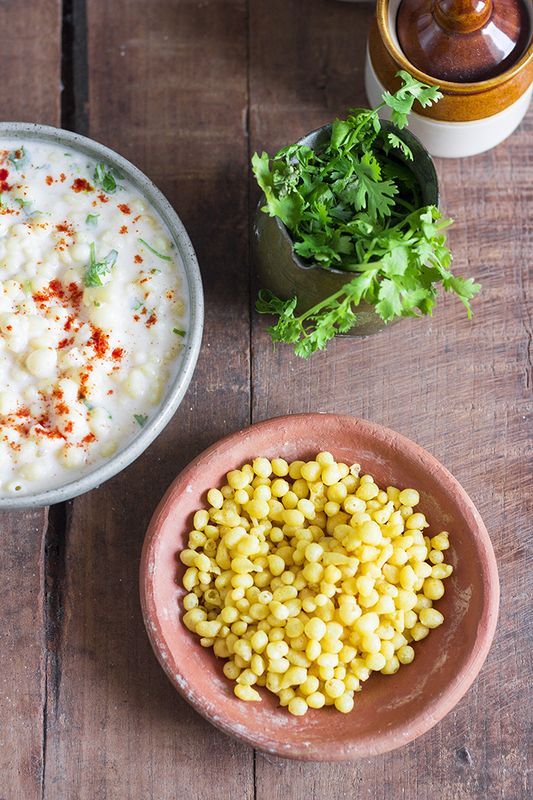 Boondi raita is made with yogurt, spices and savory fried gram flour balls called boondi. 1. Heat water until it is warm on the stove or in the microwave. 2. Remove from stove/microwave and add in the boondi. Let it soak for 8-10 minutes. 3. 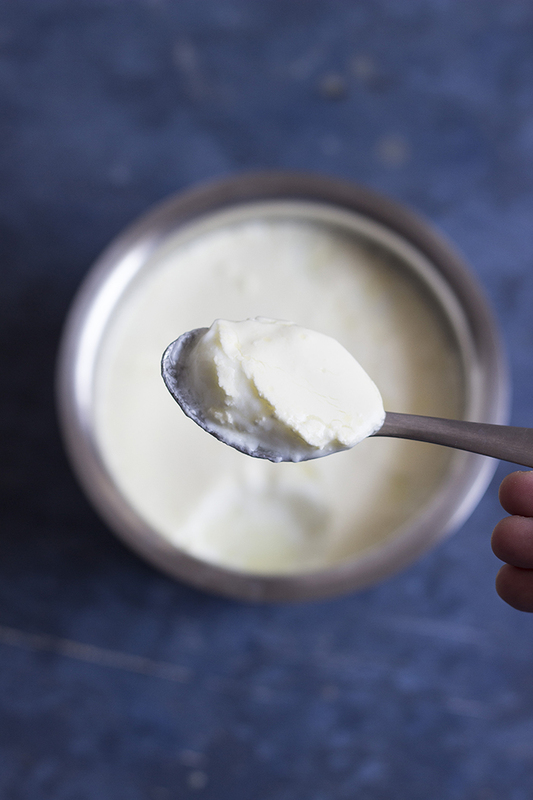 Whisk the yogurt until smooth and add in the spices. 4. Add salt to taste. The chaat masala has added salt, so add it before adding in regular salt. 5. Drain out the boondi and add to the whisked yogurt. 6. Add water if it is too thick. 7. Garnish with the chopped coriander leaves. 8. Serve cool with Biryani and Pulao. Quick and easy to make Indian mango pickle with video instructions. Simple and flavorful! It's been long that we spoke about Mangoes. 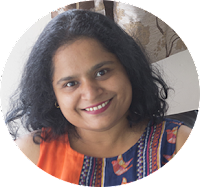 They are making their presence felt in the market and it's time to start giving them the attention they deserve. I am all for enjoying the succulent sweet ripe fruit as is. But I LOVE cooking with the tart raw mango. The tartness of the raw mango is so different from that of lime or tamarind. I just find it fresher, don't you? It may be my love for the fruit talking.